Tianjin is a vibrant metropolis in north-eastern China. More than 15 million people call the city their home, making Tianjin the fourth largest destination in the country. Discover exceptional artistic creativity, experience the local culture, and uncover centuries of history. 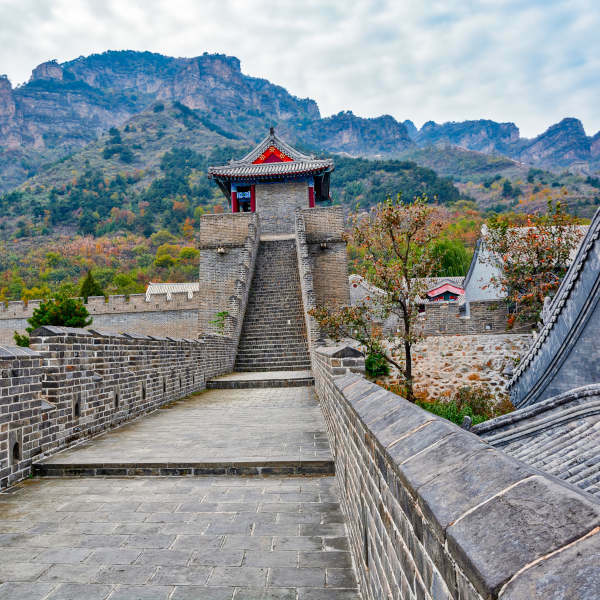 Top attractions include the Great Wall at Huangyaguan Pass, the Eye of Tianjin, and Five Great Avenues. Prepare yourself for an unforgettable adventure, with cheap flights to Tianjin available for a limited time! Just a 45-minute drive from the Tianjin city centre is Tianjin Binhai International Airport (TSN). Tianjin is home to a great number of stunning landmarks. They include the Eye of Tianjin, the magnificent Five Great Avenues, and the Tianjin Haihe Cultural Square. Like most cities in China, Tianjin gives you plenty of opportunities to discover the country’s history. There’s Jingyuan, Drum Tower, Tianjin Shijia Mansion, and Tianjin Confucian Temple. Get in touch with Tianjin’s culture! 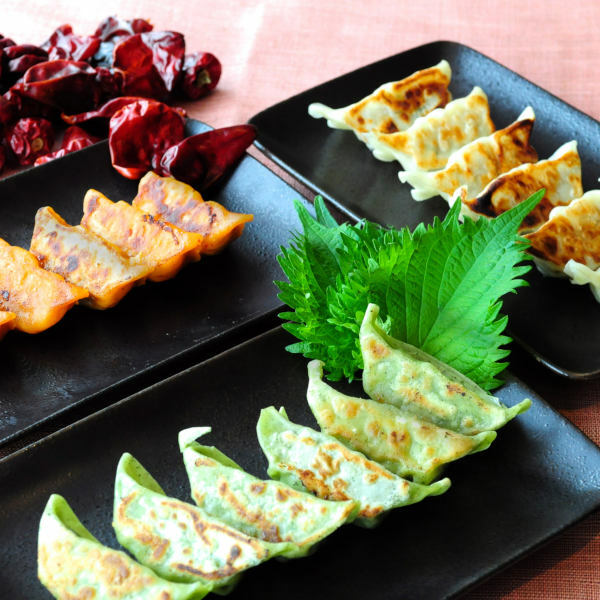 Enjoy the entertainment at opera houses, try some Tianjing goubuli, experience the popular xiangsheng, and mingle with the friendly locals. Tianjin has hot and wet summers (mid-May to August) and dry and chilly winters (November to February). Despite the conditions of the summer, many travellers flock to Tianjin to enjoy events, such as the Tianjin Beer Festival in July. Winter is the cheapest time to visit the city, although you will have to dress as warmly as you can, with temperatures dipping to nearly -10°C in the mornings. For the best time to visit Tianjin to enjoy great weather and affordable travel, choose spring (late-March to early May) and autumn (September to late October). Tianjin is a spectacular destination, rich with a contrast of historic and modern sights and sounds. Discover the city’s fascinating Chinese heritage, admire stunning architectural wonders, and experience the local culture. Tianjin offers many ancient wonders that it will take you days to explore just this one facet of the metropolis. Visit the regal Jingyuan, the former home of Puyi, the last emperor of the Qing dynasty, the very last dynasty of China. Head just outside the metro for a day trip to Dule Temple, more than 1,000 years old! Tianjin also shares in China’s historic wealth, with part of the Great Wall of China at Huangya Pass. Explore the magnificent Five Great Avenues (known as Wu Da Dao in Chinese). Five parallel streets from east to west housing more than 230 buildings with architecture from places around the world, including England, France, Germany, Italy and Spain. 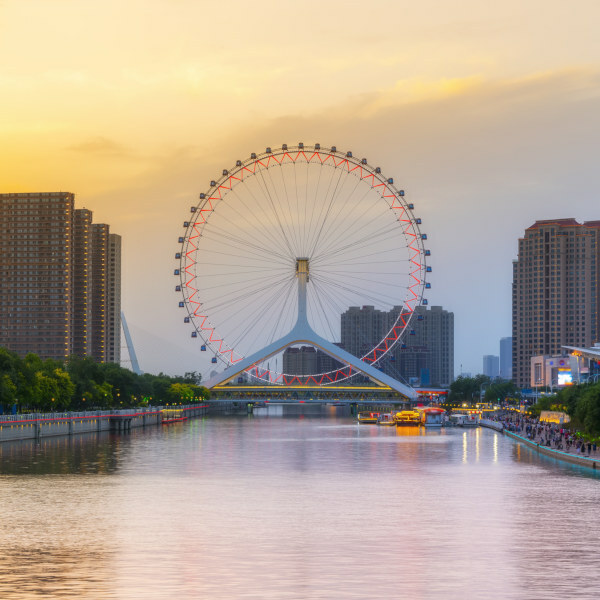 Catch amazing sights of the colourful Eye of Tianjin in the evenings, which makes for great photos, or better still, enjoy a ride and treat yourself to unforgettable views of the city. Thanks to a history of more than 600 years, Tianjin has an exceptional urban style of Chinese and Western. Discover the city’s artistic heart. Experience the hugely popular Chinese form of comedy, xiangsheng. Admire the unique creations of Yangliuqing colourful wash painting. Meet Zhang’s clay figurines, a colourful set depicting the diverse history and lifestyle of China. Let’s not forget the locals, of course! The people of Tianjin are known for their welcoming and jovial nature. They will certainly enhance your experience of this Chinese metropolis! Compare several airlines and book your cheap flights to Tianjin online with Travelstart! Tianjin offers you as safe an environment as any destination in China. Women have reported they are comfortable to walk anywhere in the city’s well-lit areas. Nevertheless, avoid letting your guard down completely, refrain from displaying your valuables, and stay relatively alert. If you end up drinking at a night club, make sure to arrange your transportation beforehand to avoid making yourself an easy target. At most of the nightclubs, the locals don’t appreciate loud or anti-social behaviour. When travelling with a cab, make sure the driver turns on the meter before departing. Some drivers don’t turn on the meter to try and overcharge foreigners. If they refuse to turn on the meter, get another cab. For other travelling options, use the public bus system, but avoid other people offering transport or day tours; they are doing so illegally. You would be wise to get all your routine vaccinations before making your way to Tianjin. You may also wish to get yourself immunised against hepatitis A and typhoid.